When we reported earlier this week on the troubles in Pakistan, we were keen to remind everyone that the 200 million strong nation is also a nuclear power, which is why any mass protest in the Asian country is always looked on with peculiar interest. The violent protests have now led to a worrying finale for the Christian woman, Asia Bibi, who was acquitted by the Supreme Court earlier this week for blasphemy of Islam. The Islamic extremist parties called upon their supporters to block the roads toward major cities and even attack police if they had to. One of their leaders also asked the personnel of the three-panel supreme court judges to murder them. 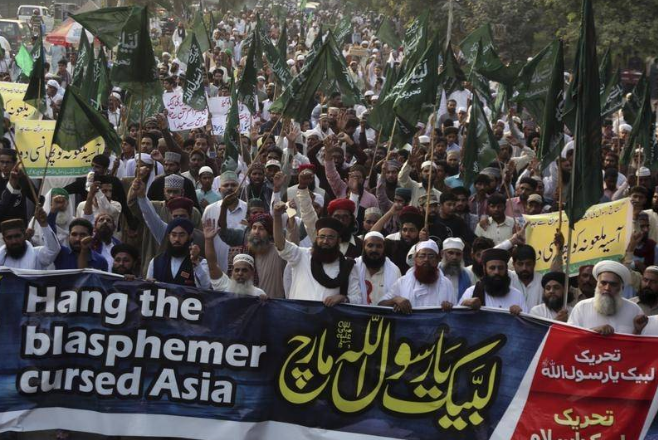 Related coverage: <a href="https://thegoldwater.com/news/40983-Pakistan-Islamist-Uprising-Roads-Blocked-Violence-Over-Blasphemy-Verdict-Video"> Pakistan – Islamist uprising roads blocked, violence over blasphemy verdict</a>. Although the government of Prime Minister Imran Khan at first spoke very tough language and warned the Islamist parties not to ‘test the state,’ he, in the end, gave in and has now surprisingly forbidden the woman from leaving Pakistan, leading many worldwide onlookers to fear for her life. Her lawyer has fled the country fearing for his life while her husband, Mr Ashiq Masih, is calling on the US or the UK to intervene as the moderate citizens in Pakistan fear the Islamists will want more now that they’ve been able to force the government into giving in. Mr Masih told European reporters (Spain and France have offered the family asylum) that "the agreement has sent a shiver down my spine. It is wrong to set a precedent in which you pile pressure onto the judiciary." "The current situation is very dangerous for us. We have no security and are hiding here and there, frequently changing our location. My wife, Asia Bibi, has already suffered greatly. She has spent 10 years in jail. My daughters were dying to see her free, but now this review petition will prolong her plight." The Pakistani government of Mr Khan agreed with China earlier this week to grant them a loan. Note the picture of the banner above. Why is English being used on a Islamic protest banner? Those muslim men look like psychopaths. They are all as crazy as bedbugs in those countries. Over one small woman? Sickos! !